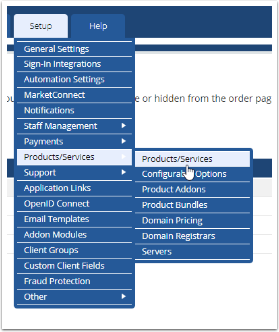 Now that you have installed WHMCS, one of the first steps will be to setup your products. To get started, we will be setting up a product group. Product Groups are collections of related Products or Services you are offering for sale. For example, we will be creating a product group that will house our Shared cPanel Hosting. On this screen, choose Create a New Group from the options area. In our example we will be calling the product group Shared cPanel Hosting. We will also specify a Headline, Tagline, Choose the Order Form Template, and Pick the Payment Gateways we would like our customers to be able to purchase from this group. After filling out the information, click on Save Changes. You have now setup your first Product Group! The next step will be adding your First Product! Our guide for doing this can be found here.